Congratulations to our Peace Poster winners. 1st place, Miranda Dunn from SV Middle School and 2nd place, Audrey Pohlod from St. Alphonsus School. 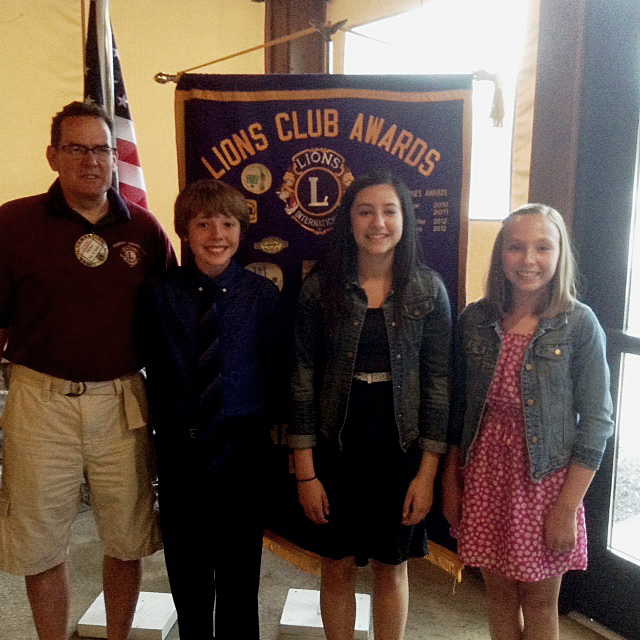 Audrey is pictured with contest chairman Lion Bob Isler. 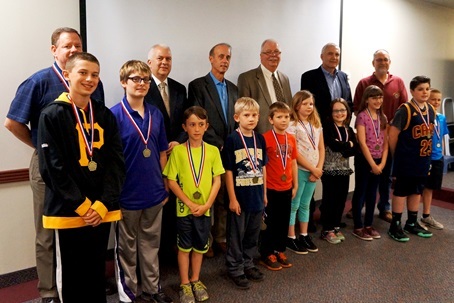 Winners of the April 30, 2016 Hoop Shoot Classic were presented with medallions at the May 5 meeting of Cranberry Township's Board of Supervisors. The Classic is a national event involving more than three million boys and girls. It includes six age groups: Boys 8-9, 10-11, and 12-13, and Girls 8-9, 10-11, and 12-13. Following local, district, state and national competitions, six champions, including both boys and girls, are named in each category. Registration proceeds from Cranberry’s local event this year will be directed to the Miracle League Field resurfacing project and its adjacent new Out-of-the-Ballpark playground, both of which are parts of Cranberry Township Community Chest's 2016 Project of the Year. 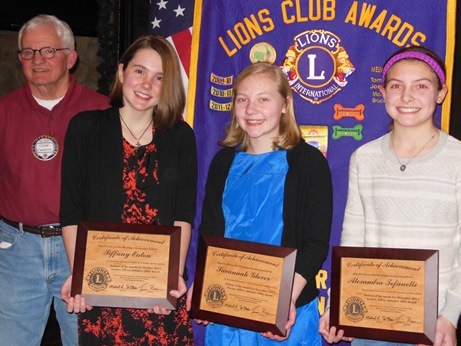 (l-r) Mr. Magerko, SVMS Guidance Counselor, Angelina Dragovits (October 2015), Norah Seibel (November 2015) , Zoe Stebbins (December 2015); Lion Tim Holt. (2015) Our spring SEI (Service, Effort, Initiative) recipients and Peace Poster contest winners: (l-r) Grace Sloat, Emily Tekelenburg, Aiden Hoffman (SEI) and Maranda Dunn and Kailey McStten, Peace poster content winners. What a great time we had on March 21, 2015! 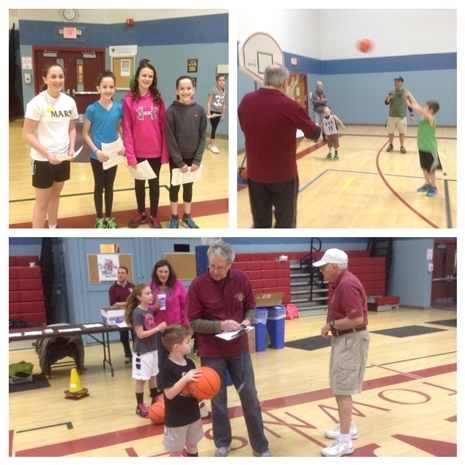 Over 35 boys, girls and their parents joined us for our 4th annual Hoop Shoot Classic, in the Cranberry Township Municipal Center gym. Proceeds will benefit the VIP Sports Camp, a Lion-supported summer camp for visually impaired children and teens. Late in January 2015, the Cranberry Twp. 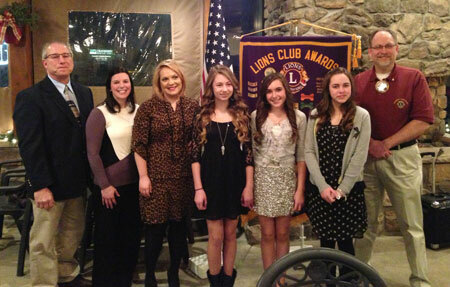 Area Lions Club held its first of two yearly SEI Night ceremonies. SEI stands for Service, Effort and Initiative, as the Lions recognize top honors students from Seneca Valley Middle School for their outstanding accomplishments and activity involvement. The three top students recognized were: Tiffany Eaton, Savannah Glover and Alexandra “Lexi” Tofanelli. These awardees represented the “Student of the Month” category from the months of October through December respectively. Tiffany Eaton is a 14 year-old eighth grader who resides with her family in Zelienople. She is very active, participating in the Middle School band, art club, newspaper and Student Council. Tiffany has been a straight-A student this year and even achieved a national qualification for the Academic Games as a sixth grader. She’s also been active in Girl Scouts for eight years and is hoping to achieve her Silver Award. In addition Tiffany is very involved with her church. Savannah is a 14 year-old eighth grader residing with her family in Cranberry Twp. She is on the high honor roll this year at Seneca Valley Middle School. Savannah is very active in her church and her community as a volunteer. She is involved in many extra curricular athletic activities and loves to play the clarinet and piano. In addition Savannah has exceled in gymnastics since she was little. Alexandra is a 13 year-old eighth grader residing with her family in Evans City. She is an excellent student and participates in many extra curricular activities such as basketball and soccer. Alexandra is also very active with her church and in the past has been a bell-ringer for the Salvation Army. In addition Alexandra would like to become a teacher when she grows up. Middle School guidance counselors Jennifer North, Tammie Limmer and Bob Magerko each highlighted all the wonderful accomplishments and positive things each student has achieved both in and out of the classroom. Club secretary Tim Roscoe and acting King Lion Clyde Cameron presented each SEI student with a certificate of recognition, along with a $50. gift card to Barnes & Noble. 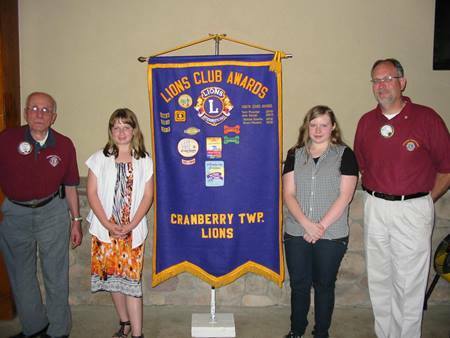 Lions Tim and Clyde also presented each guidance counselor with several Cranberry Lions Club mementos. A great crowd of over forty club members and SEI guests combined attended this fun filled night. (2014) Our semi-annual SEI (Service/Effort/Initiative) night ceremony was held on May 27, to recognize a group of Seneca Valley Middle school students for their outstanding service, effort and initiative, both in and out of the classroom. (2014) Three Peace Poster contest winners from the local area were also recognized for their creative efforts in the contest. King Lion-Elect Mike St.Clair presided over the ceremony, as did Lion Bob Isler. Isler recognized Peace Poster winners, Kailey McSteen “first place”, Shirlann Harmon “second place”, and Raya Abedin “third place”. Each honoree received a certificate of recognition and a $50 gift card to Barnes & Noble. St.Clair and club Secretary Tim Roscoe also recognized the three SEI recipients, Skylarr Spears, Emma Choban, and Matthew Stenglin for their outstanding achievements, both in and out of the classroom. Middle School guidance counselors Bob Magirko, TammyLimmer and Jennifer North also recognized each honoree for their great accomplishments by reading excellent written reports from their classroom teachers. Each SEI student also received a certificate of recognition and a $50 gift card to the bookstore. 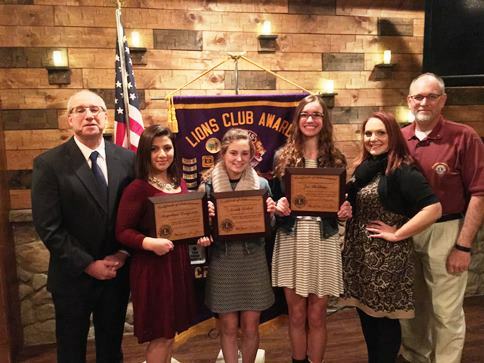 Secretary Tim Roscoe presented each guidance counselor with several special Cranberry Lions Club mementos. 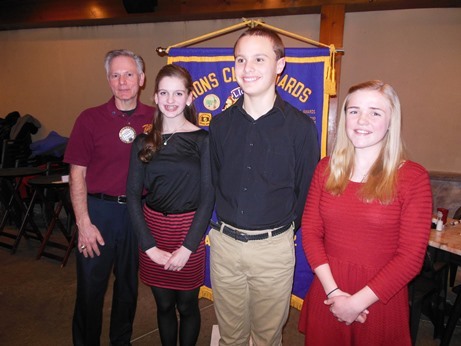 Three SVMS students were recognized by the club in February 2014 for their outstanding accomplisment and achivements in, and out of the classroom. Pictured, (l-r) King Lion Chuck Caputy, Maggie Holl, Malik Talaat, and Rachel Winterhalter. The SEI Award (Service, Effort, Initiative) is presented twice yearly by the Lions to recognize the accomplishments of Seneca Valley middle school students both in and out of the classroom. Their guidance counselors were on hand to share their outstanding achievements, as proud parents and family looked on. Club President Tim Holt led the recognition ceremony and presented each student with a certificate and a $50 gift card to Barnes & Noble bookstore. The Club is pleased and proud to welcome the students, counselors and parents as guests of the club for dinner and the May 28 recognition program. 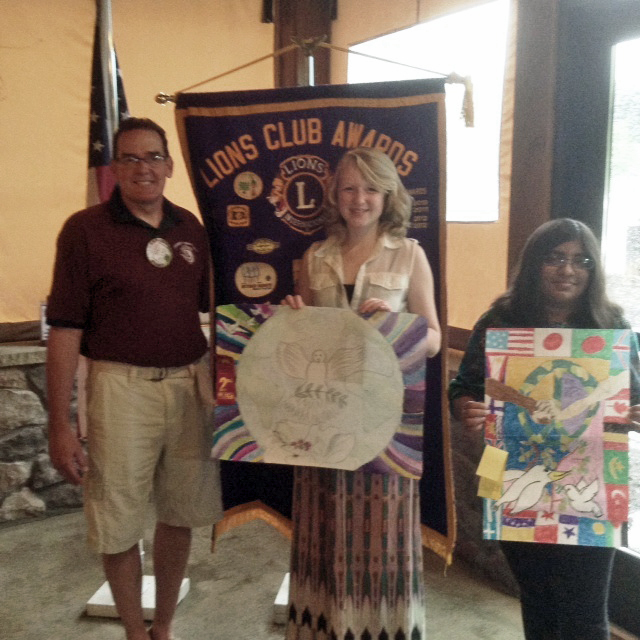 Each year, Lions clubs around the world sponsor the Lions International Peace Poster Contest. This art contest encourages young people worldwide to express their visions of peace. For 25 years, more than four million children from nearly 100 countries have participated in the contest. The theme of the 2013-14 Peace Poster Contest was "Our World, Our Future." 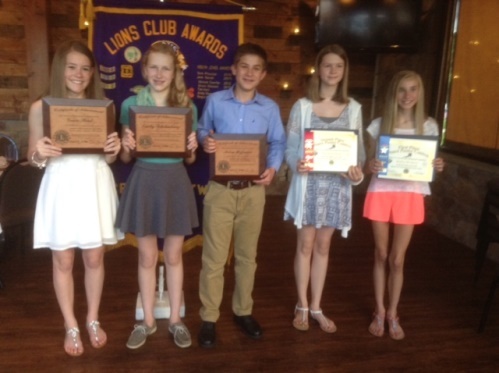 This year, Seneca students won the top prizes at both the local club level and district levels. SVMS student Kelly Cannon won first place; and Gabriella Reynolds, who attends Haine M.S., won second place. The Club recognized three students for their outstanding efforts in service and leadership. The SEI Award (service, effort and initiative is presented twice yearly to recognize Seneca Valley Middle School students for their outstanding achievements and accomplishments, both in and out of the classroom. The students are. Isabelle Biase; Hollen Davinsizer; and Cylie Aronsohn. They were honored with the “student of the month” award for the months of October, November and December. 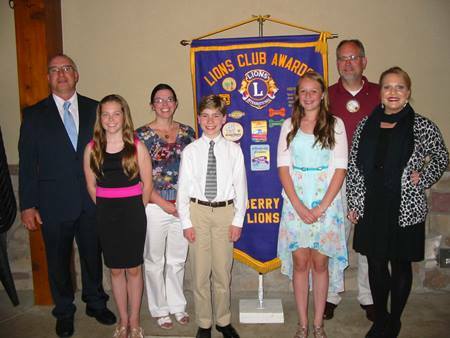 Each SEI recipient was accompanied by family members, as guests of the Lions. Seneca Valley Middle School guidance counselors shared a list of outstanding achievements each student has accomplished in and out of the classroom. Club President Tim Holt presented each student with a certificate of recognition and a gift card to Barnes & Noble bookstore.